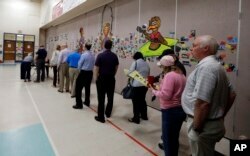 FILE - People line up to vote at a precinct in Matthews, N.C. As U.S. voters go to cast ballots for their next president in November, some will be turned away from polling places because of state laws that require showing identification. FILE - People line up to vote inside a precinct in Matthews, N.C., Tuesday, March 15, 2016. Many factors can account for lower election turnout, but a University of California, San Diego report released in February found no apparent relationship between the strict photo ID laws and overall voter turnout. A U.S. Government Accountability Office report cited a few of the reasons people struggle to obtain government identification. Some people lack transportation to get to the appropriate government office, while others do not have the necessary documents -- like a birth certificate -- to get the card. The GAO also cited the cost of state driver's licenses, though many of the states that require voters to have ID provide a free form of identification. FILE - Actress America Ferrera talks to students at Rancho High School as she partners with Voto Latino to discuss the importance of young voters, including Latinos, participating in the civic process on February 11, 2016 in North Las Vegas, Nevada. Attorney General Eric Holder stressed in a 2012 speech the need to be vigilant in preventing voting fraud, but that "political pretexts" will not be allowed to keep Americans from exercising "their most precious right." Ahead of the 2012 election, Justin Levitt wrote in a report for the American Constitution Society for Law and Policy that evidence of such fraud is "extraordinarily rare."